Contents/synopsis: The Zoological Society of London celebrated its 150th anniversary in 1976, and as a mark of this occasion called together a meeting at which papers were presented by some of the Fellows and Staff of the Society. This book records those papers and the proceedings of that meeting and pays tribute to the work and achievements of the society. The Zoological Society developed into a major centre of zoological research since its inception in 1826 and its most famous foundation London Zoo has long been attracting thousands of eager and delighted visitors. For all of those with an interest in zoology or the history of scientific research, this beautifully illustrated book will offer a fascinating insight into the development, problems and future plans of the Society and London Zoo. The book covers a wide range of topics - early chapters look back to the foundation and growth of the Zoological Society of London. The secretary at the time of publication - Lord Zuckerman- discusses the people, events and trends that shaped the society's constitutional status. Other contributors illustrate the part the society played in the development of zoological knowledge in the last century and examine some of the notable characters, controversies and discoveries of the period. 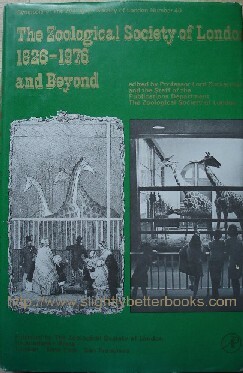 The book goes on to discuss developments in the care, management and housing of animals at the Society's two Zoos, and to give a detailed survey of building at the London Zoo and of the growth of the Society's Library, publications and educational activities. Finally the book discusses the future role of the Zoological Society, especially in the chapters which look at the comprehensive programme of zoological research being carried out with the support of the Society and at its two research institutes.